A focus group is where a group of people (from around 4 to 12) are asked questions about their experiences and opinions on particular topics. Focus groups use a facilitator and a semi-structured interview process to prompt discussion amongst a group of people. The group can be representative of the target group, or they may represent subsets of the target group if you are looking to identify how different groups have experienced a certain intervention. Focus groups can be used in a self-contained manner for the purposes of exploring new initiatives or for understanding participant’s own perspectives on a project. Two different types of focus group techniques (ORID and Lessons Learnt workshop) are explored in the sections below. For more information on focus groups, see the Department of Sustainability and Environment Effective Engagement Toolkit, Book 3, p32. The ORID method is a focus group process that facilitates a structured discussion process that can be used for small groups (up 12 people). The ORID process provides valuable qualitative information on the strengths and weaknesses of a project, based on the viewpoint of the participants (or other stakeholders). As such, the process can provide some valuable learnings to improve further phases of a program, or to design a new program or vision for future initiatives. A projector and computer are optional, but can be useful to show the ORID process, and remind the participants of the prompt questions for each part. A good way to start focus group sessions is to provide a general welcome and then use an icebreaker to get everyone speaking. For example, you can get people to have a quick chat in pairs, and find out a couple of things from each other, such as something sustainable that they have recently done, or their favourite food, or holiday destination etc. Then, one half of the pair will introduce the other person, by saying their name, what they have recently done, their favourite food (or whatever you choose). Everyone then has takes a turn at introducing the person next to them. The facilitator should then provide a brief introduction to the ORID process, highlighting that it is a structured discussion which may seem awkward but that it provides a way to work through issues following the natural process of the mind. It is also worth the facilitator explaining that the ORID process provides valuable information from the participants perspective, and that the learnings will be valued by the Council (or organisation) as a means to improve the project. After all, there is nothing worse than thinking your input is not valued! The facilitator should then proceed to set a few rules, such as listening to other people, respecting everyone’s opinion, and not having one person dominate the conversation. Once this has been completed, the facilitator can step through the ORID process, as outlined below. 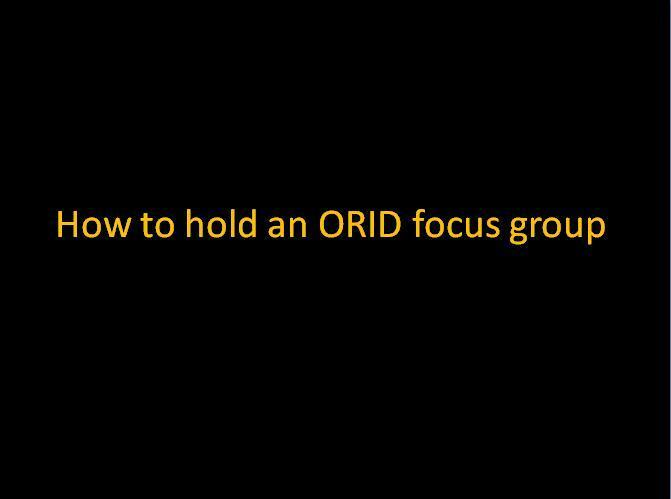 A running sheet to undertake an ORID focus group is provided here. A PowerPoint to accompany the running sheet and to use in your ORID session is available here. It is important to remind the participants not to explain their observations, but rather keep them to one or two words. For example, observations of a workshop series may include speakers, or something a speaker said, the venue, handouts etc. If there are similar observations, it is best to group like themes, but remember to ask the participants if they agree on the groupings. If there is disagreement, keep them separated. The following steps are repeated for each observation. It is important to ensure that participants do not explain their feelings at this stage. Remember to ask all the participants for their reflections on a theme, even though they may have not raised it as an observation. The reflections do not necessarily have to be written up on a whiteboard, though it may be useful to jot down summary points in order to prompt the following step. It is recommended that the facilitator keep brief notes to recall interesting reflections that they may want to refer back to. Once you have obtained the reflections on the first observation, move on to discussing the insights that arise from the reflection. Again, the insights do not necessarily have to be written up on a whiteboard, though it may be useful to jot down summary points, especially the implications and options, in order to prompt the following step. 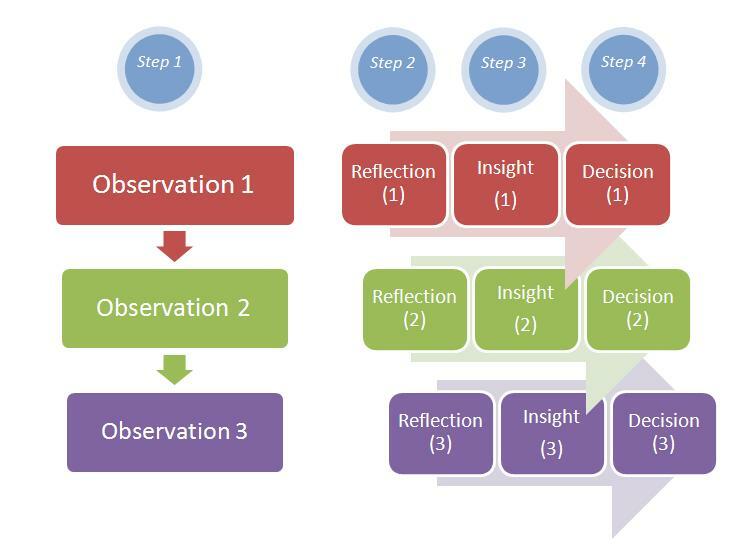 Once you have obtained the insights on the first observation, move on to discussing the decisions. Having completed the R-I-D for the first O, go to the second observation and repeat the process until you have completed this for all of them. A lessons learnt workshop is another variation of the focus group. The lessons learnt workshop can be used by projects, teams or organisations as a participatory evaluation tool. The workshop can be held at stages throughout a project (formative evaluation) or held at the end of the project (summative evaluation). Why conduct a lessons learnt workshop? Lessons learnt workshops can be held at multiple points throughout the design and implementation phase of a project as part of a continual monitoring process to assess how well the project is being designed or implemented. Through this monitoring, continual improvement can occur by trying to do more of ‘what the project is doing well’ and to address issues in areas that need improving. Lessons learnt workshops are often held at the end of a project as part of an end-of-project evaluation to uncover key findings and recommendations. Findings and recommendations can be used to report back to project stakeholders and inform future project design and implementation to increase the likelihood of success. The lessons learnt workshop is guided by three key questions documented in the table below. What should be do differently for the remainder of the project? 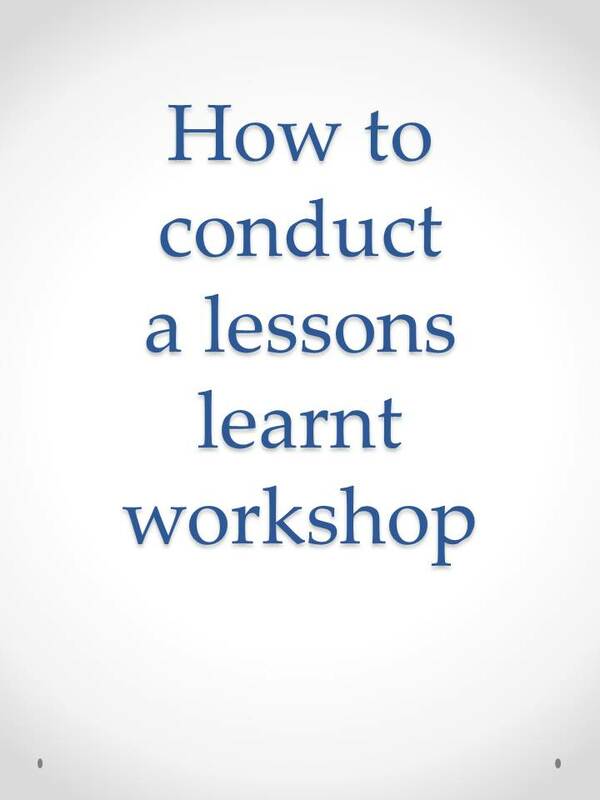 A downloadable guide on how to conduct a lessons learnt workshop has been created that will help you think about what you need to consider and what steps you need to follow to prepare, host, report back and provide feedback. A detailed session plan is also included to help you or someone else facilitate the workshop.